The metal toy keys and the plastic key ring can break, posing a choking hazard. The U.S. Consumer and Safety Product Commission and Battat have received 17 reports of keys breaking, and 14 reports of key rings breaking. No injuries have been reported. This recall includes about 1,083,600 B. FunKeys with factory code H58000-01 or H26300-01, and Parents Magazine Electronic Keys with factory code H26300-01. The factory code is located on the back of the remote. The remote of the B. Fun Keys is olive green or red and the top of the keys are multi-colored. 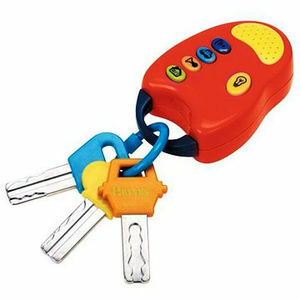 The remote of the Parents Magazine Electronic Keys comes in different colors and the top of the keys is a solid color. Both remotes have sound buttons, and the metal keys hang from a plastic ring. Retailers nationwide and online sellers from April 2010 to May 2011 for B. FunKeys, and from January 2006 to December 2009 for Parents Magazine keys for about $9. Immediately take the recalled toy keys away from children and contact Battat to receive replacement keys. Contact the company toll-free at 866-665-5524 or visit battatco.com. Our product recalls database includes information and content from the Consumer Product Safety Commission, the National Highway Traffic Safety Administration, and other sources. Our database is not comprehensive. For more complete information concerning recalls, visit www.cpsc.gov or, for car seats, www.safercar.gov.